We’d love your help. Let us know what’s wrong with this preview of Project by Joshua C. Cook. Librarian Notes: this is an alternate cover edition ASIN B00MGBA0AG - Project: Perception: A Story of Reality. Mankind is stagnant. Still fighting the same fights since the end of the 20th century. While technology advances at a blistering pace, socially, humanity is becoming stunted. Someone or Something, known only as the 'Administrator' is determined to change the path t Librarian Notes: this is an alternate cover edition ASIN B00MGBA0AG - Project: Perception: A Story of Reality. Mankind is stagnant. Still fighting the same fights since the end of the 20th century. While technology advances at a blistering pace, socially, humanity is becoming stunted. Someone or Something, known only as the 'Administrator' is determined to change the path that humanity is on. A small push in certain places, and the combined weight of public opinion will change. But who is the Administrator? What is the ultimate goal? And who will get sacrificed to reach the endgame? To ask other readers questions about Project, please sign up. This book is a sci-fi tech fantasy mystery mix. The author took the time to really develop the characters. The character development helps to give a strong plot in this book. I must admit that I was not expecting so many surprises in the book. However this is what made the book amazing for me. The ending really caught me by surprise, as I am sure it will catch you by surprise too. Overall, this is a great book and I look forward to reading more books by Cook. Overall, I liked this book a lot. My positivity is edged with a note of disappointment (I’ll get to that later), but this is nonetheless a very satisfying read. It’s a great core idea, if not entirely unique, and the details around the edges really add a depth to the tale. It’s fair to say that one has to take some rather bold leaps in accepting the path of events, but they are not insurmountable – simply challenging to validate. And the story would be nothing without its trajectory, which is ul Overall, I liked this book a lot. My positivity is edged with a note of disappointment (I’ll get to that later), but this is nonetheless a very satisfying read. It’s a great core idea, if not entirely unique, and the details around the edges really add a depth to the tale. It’s fair to say that one has to take some rather bold leaps in accepting the path of events, but they are not insurmountable – simply challenging to validate. And the story would be nothing without its trajectory, which is ultimately a good one. The book starts with a brief prologue, before really proceeding in earnest with a character called Jameston. Jameston is a ‘sphere jockey’ – effectively an engineer locked up in a remote underground maintenance unit; completely isolated from the world. While completing his year and a half assignment, Jameston starts to notice some strange ‘goings-on’, and what follows is a series of chapters dedicated to Jameston trying to establish whether he is going mad with isolation or whether it is more sinister. The book then broadens quickly, but I will get to that later. Now, this starting sequence of chapters is really well done. We get close to Jameston quickly, and really associate with his isolated situation and the concerns that he harbours. Such a lonely narrative has to be strong to maintain interest, and this certainly did – it was really well done. I found myself sympathising with Jameston, and egging him on. But this somewhat contained sequence eventually opens up and we are given a much broader space within which to breathe – and in fact, our protagonist switches. No longer is Jameston the centre of our universe, but instead Harry takes over. The transition is done well, but it is the existence of the transition that leaves me a touch disappointed. But it is a good disappointment, really. The first passage of the story, Jameston’s time, was so good that I didn’t want it to end. I would happily have followed Jameston further, but alas, it was not to be. Instead, we find ourselves thrust into a secret underground project to unite humanity (don’t worry, there is a very good link between the two parts of the story), and we then follow their efforts to make their plan reality. 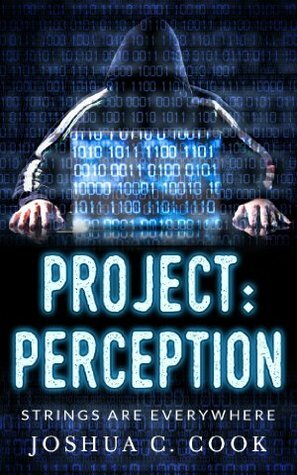 Now, there are a few good sources of friction to keep us intrigued, but I don’t think the ‘project: perception’ itself was one of them. The tools that the project uses are cleverly thought out, and at times slightly challenging to believe, but despite this, that the project will succeed never feels like uncertainty. Of course they will succeed! Instead, the friction comes nicely from the project ‘overlord’ – a mysterious character called the ‘Administrator’. It is in fact an uncertainty around the true underlying project intentions which keeps us piqued, and Harry too starts to question his loyalty. But can he question deep enough? Will he be able to act freely, or is he so entangled in the project that he is destined to follow the designated path? All good stuff, and keeps us turning pages. There are also a pair of investigators who start snooping around, and this does add another layer of uncertainty, which is good. Now, as something of an international story, the author has chosen multiple POVs for the second ‘half’ of the book. This jars a bit against the first part where we are absorbed in Jameston, but not uncomfortably so. We are focussed on Harry primarily, as we should be, and then we dip into other characters in a number of places, which is well done on the whole and does add to the story. However, there are instances of ‘head-hopping’ which can become disorientating, particularly because they occur at high pace. They are not difficult to work through, but they do distance the story somewhat. Just a warning. And this may actually be the biggest challenge with the book – the character association itself. We build a delightful rapport with Jameston, but just as we are really getting in deep, he steps back from the limelight to be replaced with Harry. And because Harry lives in a world where we also need to see other POVs, we never quite get to know Harry as well. He’s certainly not lacking depth, and is a sympathetic character with a grounded moral base and likeable flaws, but we are just not quite as close to him. Oh, and perhaps the only other thing that sticks out is the rather sharp end to the book. It is a good ending, and certainly leaves a lot of interesting questions on the tongue, but there is no ‘closing statement’ to sate the reader’s interest. And indeed, there is no suggestion of a sequel. It’s all a bit sudden. A good and largely pleasant outcome, but certainly not laboured. Perhaps one additional chapter would have sufficed. Born and Raised in Sunny (sometimes) Florida, I grew up in a house of readers. I've always been into good Sci-Fi, fantasy, and technology. In fact I ended up somehow working in the IT field for the last 13 years. One of the things that surprised me about my career was the interaction of people with technology. How blindly trusting people are of whatever the computer says on it, regardless if what i Born and Raised in Sunny (sometimes) Florida, I grew up in a house of readers. I've always been into good Sci-Fi, fantasy, and technology. In fact I ended up somehow working in the IT field for the last 13 years. One of the things that surprised me about my career was the interaction of people with technology. How blindly trusting people are of whatever the computer says on it, regardless if what it's saying is even possible.